The Eagle Superpipe is one of the largest halfpipes in North America. It's the stomping ground for the best of the best; and it's where Shaun White and Torah Bright trained for the Olympics...no big deal. Park City Mountain Resort's Eagle Superpipe plays host to the FIS Freestyle World Championships in February, where top halfpipe skiers from around the world will compete. Oh ya, and did we mention there was a little event called the Olympics in 2002 where the inuguaral snowboard halfpipe event was held in our very own Eagle Superpipe. This is not your average stunt ditch or u-tube kiddos. King's Crown super sized park is for skiers and snowboarders with serious skills. It's home to our biggest jumps and features and can be seen from the resort plaza. Heavy hitters can be found training in this park on any given day, so make sure not to fan out too hard. We all remember Torstein Horgmo's top to bottom run through King's Crown in Standard Films Black Winter. Not to mention countless photo shoots are held in Kings Crown year after year. If you want to play with the big boys, then head over to Kings Crown to test your skills. Three Kings terrain park recently replaced Pick N Shovel and is over 50% larger. They added brand new lights so you can hit this bad boy up 'til 9 p.m. every day of the week. A majority of our slopestyle events are held in Three Kings terrain park and major progression sessions happen in this park on the regular. This year you can expect to find multiple lines to suit any jib or jump feign. The jumps range in size from 25-45 ft and jibs will range from ride-on rails to innovative, next-level features. PCMR introdouced The Ridge terrain park to Park City Mountain Resort in January 2010. It is a great middle ground with a variety of medium-sized jumps, rails and funboxes for honing your skills. The Ridge is serviced by the park dedicated Eaglet triple chair so you can take hot laps all day long. If mini-parks are your style, or you want a mellow environment to dial in new tricks, then The Ridge is for you. 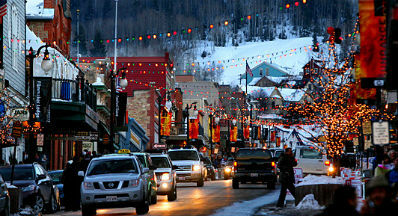 Where to Rent Skis or Snowboards in Park City? Saving you money by showing you where to get the best deals on ski and snowboard rentals is one of our services. After years or listing all of the higher priced Park City ski rental shops, we researched the market and decided to showcase the two shops that have the best deals. Location #1. AJ Motion has two shops located in Salt Lake. AJ Motion Sports Locations. Location #2. Canyon Sports is located downtown Salt Lake City just off I-15. When you fly in, get off on the 6th South exit, proceed to 200 West, turn left, we will be on your right hand side. Getting back on I-15 is a snap and you will be on your way up to Park City in minutes. Canyon Sports Locations. 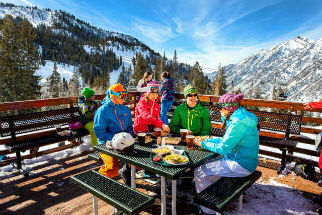 All locations have Ski & Snowboard Rentals, Discount Utah Lift Tickets, Overnight Tune-ups & Repair, Clothing Sales & Rentals, Helmet Rentals, A Full Line of Demo Skis & Boards, X-Country, Snowblade and Snowshoe Rentals.